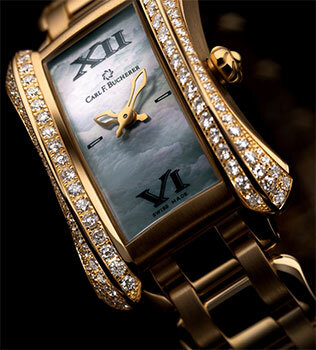 If you are looking for a distinct women’s watch, take a look at the Carl F. Bucherer Alacria collection. Fashionably feminine jeweled pieces feature curved, tapered bodies, with concave rectangle cases. Quartz movement watches include Midi, Diva and Mini models with Mother-of-Pearl dials and diamonds in both white gold and yellow gold, the Diva models with diamonds and silver dials in yellow gold and stainless steel, and the Mini yellow gold Mother-of-Pearl dial timepiece with and without diamonds. Uncover the uniqueness of the Alacria collection from Carl F. Bucherer today!